Though they are all the rage in Europe, electronic bidet seats are not yet very popular here in the United States. It turns out that a big reason for this is people are not very familiar with the benefits of a bidet toilet seat. The concept is so foreign to us, but most people who try this hygienic solution find that they prefer it to the use of toilet paper. If you are looking for a good way to bring your bathroom into the 21st century, try a bidet seat with all the bells and whistles. To understand the pros and cons of choosing an electronic bidet, you must first understand how they work. How Does a Bidet Toilet Seat Work? This illustration demonstrates the many features offered by bidet seats. 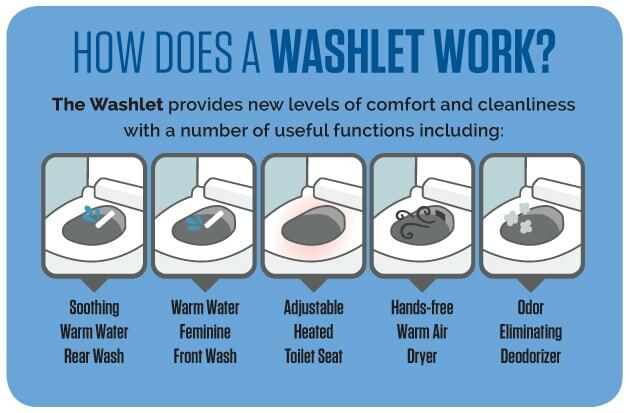 This graphic in particular is about the TOTO Washlet, which offers a heated seat option. Not every seat is going to have all the same features, this just gives you an idea if you are wondering what do bidet seats do? Electronic bidets function with remote controls. The Washlet actually has a touch pad with enough memory for two different users. You can get heated seats, deoderizers, self-cleaning features, etc. For the most part, any electronic bidet seat is going to come with rear and feminine wash, as well as the hands-free dryer, and the other features may vary from machine to machine and brand to brand. What Are the Benefits of a Bidet Toilet Seat?